Brisbane is the capital and most populous city in the Australian state of Queensland, and the third most populous city in Australia. Brisbane's metropolitan area has a population of 2.24 million, and the South East Queensland conurbation, centred on Brisbane, encompasses a population of more than 3 million. The Brisbane central business district stands on the original European settlement and is situated inside a bend of the Brisbane River, approximately 15 kilometres from its mouth at Moreton Bay. The metropolitan area extends in all directions along the floodplain of the Brisbane River valley between Moreton Bay and the Great Dividing Range. The metropolitan area sprawls across several of Australia's most populous local government areas, including the City of Brisbane, which is by far the most populous LGA in the nation. The demonym of Brisbane is Brisbanite. 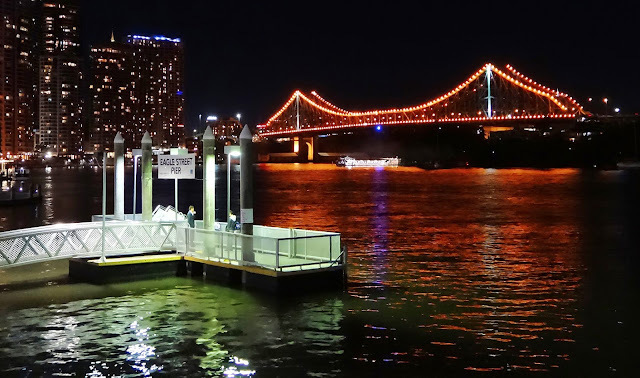 Brisbane is named after the Brisbane River on which it is located, which in turn was named after Scotsman Sir Thomas Brisbane, the Governor of New South Wales from 1821 to 1825. The first European settlement in Queensland was a penal colony at Redcliffe, 28 kilometres north of the central business district, which was founded in 1824. That settlement was soon abandoned and moved to North Quay in 1825. Free settlers were permitted from 1842. Brisbane was chosen as the capital when Queensland was proclaimed a separate colony from New South Wales in 1859. Brisbane has certainly grown since I was there thirty-some years ago, but it seems to have retained its beauty if your photo is any indication. Nice photo of the lights reflected on the water.